Chives are a member of the health-promoting Allium family that includes onions, leeks, and garlic. They have a mild oniony flavour. Chives are easy to grow, rarely bothered by pests, and make an attractive addition to the garden with their hollow bright green edible leaves and pretty lavender-pink flowers (also edible). The flowers are useful for attracting pollinators. Chives can be propagated from seed or by dividing. Chive plants are perennial, which means that they revive again each spring (or grow year-round in mild climates). Chives are robust, with an ever-expanding root network and a tendency to drop lots of seeds, so they can spread rapidly throughout the garden. Garlic chives are a chive variant with flatter leaves, white flowers, and a flavour more evocative of mild garlic than onions. When can I plant chives? Chives are usually planted in the spring, but can germinate in temperatures ranging from 45-95 Fahrenheit (7-35 Celsius). You can start them indoors 8-10 weeks before the last anticipated spring frost to get a head start on the growing season. Most sources recommend starting with a store-bought plant and propagating by dividing rather than growing chives from seeds, as dividing is quicker and easier. How far apart should chives be planted? Allow each plant at least 4-6 inches of space for best results. How long will chive seeds take to sprout? Chive seeds can take anywhere from 7-21 days to germinate. What type of soil do chives need? Chives aren’t fussy about soil – they’ll grow in almost any type. For best results, add compost to the soil before sowing or transplanting. Can I grow chives in a container? Yes, chives do well in containers. They’ll need to be watered more frequently though, as container soil dries out quickly. For best results, the container should be at least 6 inches deep. Chive roots will spread aggressively, so they can take over containers shared with other plants. Can I grow chives in the shade? Yes, chives can be grown in either full sun or partial shade (only 3-6 hours of full sun per day). Can I grow chives indoors? Yes, chives can be grown in a pot on a sunny windowsill, and indoor chives can be harvested year-round. If you prefer to grow them outdoors during the warmer seasons, you can pull up the clump of chives, transplant it to a pot, and bring the chives indoors for the winter to keep harvesting throughout the cold season. Should I fertilize my chives? Chives rarely require fertilizer. However, if the soil is very nutrient poor, adding a bit of nitrogen-rich compost or a small amount of nitrogen-rich fertilizer can be beneficial. What ongoing care do chives need? Chives need very little maintenance. Just harvest regularly to keep the plants vigorous and encourage them to spread, water if the soil is in danger of drying out completely, and divide the plants every 2-5 years in the spring or fall. Removing the flowers as they appear will encourage the plants to put more energy into leaf production. How long do chives take to grow? Chives take 75-90 days to mature after sowing. Plants that are well-established (more than a year old) can be harvested regularly. When can I harvest chives? Chives can be harvested from spring through fall, or year-round if you provide some cold protection (for example, a cold frame or greenhouse) or bring them indoors in a container and place them on a sunny windowsill. Use a pair of clean scissors to snip them off at the base, just above the soil, and then cut them into smaller pieces to add to salads, potatoes, soups, sauces, and spreads. Stop harvesting a few weeks before the first frost to allow chive plants to re-establish so that they’ll be strong enough to withstand the winter (in cold climates, chives will die back and return in the spring; where winters are mild, they can grow outside throughout the year). How do I store chives, and how long will they keep? Freshly harvested chives can be placed in a sealed plastic bag and stored in the refrigerator for up to a week (you may be able to extend the storage time by wrapping them in a damp paper towel before placing them in the bag). Chives aren’t a good herb for drying because they lose most of their flavour. If you want to store them for a longer timeframe, snip fresh leaves into pieces and mix them with water in ice cube trays, then freeze and remove individual cubes to thaw as needed, or just freeze them without the water in airtight plastic bags (squeeze all the air out of the bags for best results). Frozen chives should maintain their quality for 4-6 months. How do I save seeds for chives? If you want to save chive seeds, just wait for the flowers to dry and then crumble them to release the seeds. Store the seeds in a dry, cool, dark location. Chive seeds should keep for around 3 years in good storage conditions. You can also divide clumps of chives in the spring or fall to produce more plants. How do I cook chives? Chives are usually chopped raw into salads or used as toppings for potatoes, though they’re also great in scrambled eggs, soups, and sandwiches, and in spreads and oils. 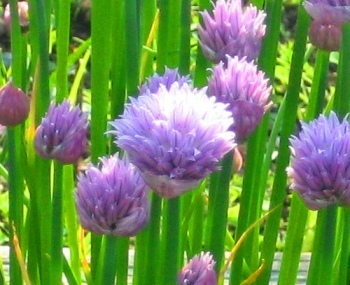 Fresh chive flowers can be added to salads or used to make flavoured pink vinegar. Jayme Henderson provides recipes for chive butter, chive oil, and chive blossom vinegar on the Kitchn.com. For more chive recipes, see Cheddar and Chive Cornbread, Saveur’s Recipes with Chives, and Cooking Light’s Cooking with Chives page. For more gardening articles, see the main Gardening page. Albert, S. (n.d.). How to Grow Chives. HarvesttoTable.com. Cornell University Growing Guide. (2006). Chives. Gardening.Cornell.edu. Day, S. (2010). Incredible Edibles: 43 Fun Things to Grow in the City. Richmond Hill, ON: Firefly Books. StillTasty.com. (2016). Food Storage – How Long Can You Keep Chives – Fresh, Raw. The Old Farmer’s Almanac. (n.d.). Chives: Planting, Growing, and Harvesting Chives. Almanac.com.